In the most obvious sense, the woman on the cover stands in for—and introduces us to—the Indigenous women that form the core of The Break: the women whose warmth, love, and strength wearily push back against the pain and colonial violence that beset their family and the story itself. More broadly, however, Wollf’s Métis woman also holds space for Vermette—positioning the author within that community and declaring her responsibility to a certain people, place, and history. This initial positioning, before the first page is even turned, is a poignant gesture in contemporary Indigenous literature—where an author’s accountability to place and community play vital roles in determining a story’s impact and its reception. 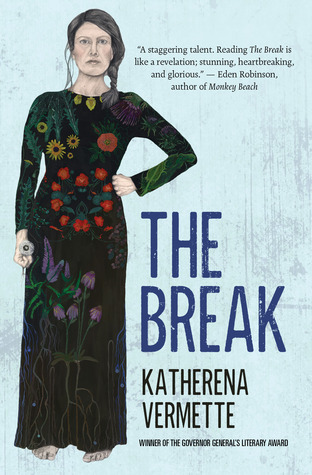 The Break, like Wollf’s Métis woman, is a beautifully interwoven narrative about family and endurance and, as such, a stunning example of the intimacies of place. As a poet and author, Vermette’s work has always been grounded in her home. She is a fierce advocate for the Indigenous peoples of Winnipeg’s North End and in Treaty One territory, which she identifies as “the heart of the Métis nation” (“Métis). A large portion of her work has been committed to changing representations of the North End—including her first book of poetry, North End Love Songs (2012), which was an ode to that neighbourhood, in which she spent her teens. The Break furthers the author’s connections and commitments to Treaty One territory and Winnipeg’s North End. The novel begins with a description of the eponymous section of the city: “The Break is a piece of land just west of McPhillips Street. A narrow field about four lots wide that interrupts all the closely knit houses on either side and cuts through every avenue from Selkirk to Leila” (3). As the title suggests, then, the “Break” is connected to specific land and places in the North End. But the “break” is also representative of the pain, disturbance, and dislocation that affect that community and drive the novel’s plot and character development. The Break is part mystery, part family narrative, and part colonial critique. Beginning from the perspective of a crime’s only witness, the novel unfolds around the sexual assault of a young Indigenous woman on the streets of the North End. Through the overlapping perspectives of that woman’s family and community, including her mother, grandmother, great-grandmother, a police officer, and the assailant, Vermette slowly and deliberately unpacks the crime, its structural causes, and its intergenerational effects. While place and family up the structure of The Break, sexual violence against Indigenous women drives the story. “This was a really hard book to write, and it was a really hard book to put out in the world,” Vermette told the Globe & Mail. “I wanted to talk about the impact of sexual violence, and the impact of the legacy of sexual violence. You can’t really do that lightly” (Medley). She does not. At the core of this novel is Vermette’s artful balancing of trauma and love, violence and community, loss and resilience. While the content is heavy and often difficult to bear witness to, it is never hopeless. Exhausting, maybe, but never desolating. The “break,” as a concept, may, in some senses, refer to violence and division, but, for Vermette and her narrators, it is also home. The content of Vermette’s storytelling is rooted in her community, but community is also reflected in the novel’s form, which pushes this novel from good to great. Indeed, the author’s technical skill is evidenced most explicitly in her ability to juggle and explore perspectives while advancing story. There are ten separate narrators in The Break, each of whom bear witness to the violence at the centre of the story from his or her own unique experiences. While the novel’s central narrative is gripping in itself, these multivalent angles are what give the story its life and depth. The compounding perspectives highlight the ways in which the community rallies around and supports its survivors. In revealing the deeply structural nature of violence against Indigenous women, however, they also demonstrate the efforts required by Indigenous women to keep their families and themselves alive and safe. Even with its many voices, the novel never feels disjointed or fragmented; Vermette beautifully binds their testimony together and evokes the shared history of the North End community, in its love, violence, and in its endurance across time and family. The “I am Métis” image that graces the cover of The Break is an unapologetic introduction to the grounded, Indigenous position from which that story is shared. The exercise of accountability that it helps to establish is, for both the author and the reader, one of the novel’s chief duties and its most profound achievements. The Break is one of the best novels I read in 2016. It is powerfully conceived and and exquisitely crafted: rich with characters that will sink deep within your consciousness. Put it on your reading list today. Broadcasting Corporation. January 16, 2016. Web. Winnipeg’s North End.” Globe & Mail. October 28, 2016. Web. Canadian Broadcasting Corporation. April 25, 2015. Web.